Counterveillance expert and editor of Cyber Defense Magazine, Gary Miliefsky, reveals that flashlight apps can secretly gather personal data from the user’s smartphones and send them to cybercriminals. In his website, SnoopWall, Miliefsky posted 10 different flashlight apps that can allegedly take away private information from the user. According to SnoopWall, certain Flashlight apps can access information that is beyond the necessary need of the app. The site also presented the list of permissions shown by the flashlight apps which Miliefsky believes many people see but do not take time to read and comprehend as they download the app. The permissions of certain flashlight apps include retrieve running apps, delete or modify content of USB storage, takes pictures and videos, view Wi-Fi connections, disable screen lock and others that are seemed questionable since a flashlight app is a simple app to open the phone’s torch. Miliefsky advised people to disable their smartphone’s GPS, Bluetooth and NFC if not needed, verify the app’s behaviour and privacy risks through researches, and pull out the smartphone’s battery or put a sticky tape on the cam and microphone if not in use. The flashlight apps as believed by Miliefsky can also set up a way to for the Trojans to infect the smartphones. He then suggested people to uninstall the risky apps, then install their very own flashlight up that is on 72KB. Snope.com however cited Wired that though these apps has certain permission, it does not mean they are using it. Free apps tends to be more risky. 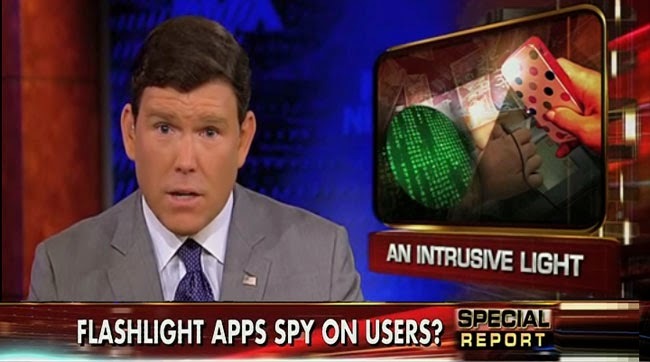 In his interview in the Fox News, Miliefsky even said that users of the highly risky flashlight apps must factory reset their phones when they want to uninstall the app because simply uninstalling it won’t help. This news gathered various reactions such as people from an outrage about seemingly innocent flashlight app.